Critical Autoflowering is a rare breed belonging to a feminised Indica-dominant cannabis strain, which can be cultivated easily both indoors as well as outdoors. This hybrid strain (Critical + auto flowering) comes packed with an intensely sweet and fruity flavour because of which it is considered a novelty among all the auto flowering strains. It’s a rare breed that fully encapsulates the essence of pure power. The flavour is awesome yet intense, the yields bountiful and effects beyond words. It provides complete satisfaction to both the breeder as well as the user. Bred similar to Critical, the auto-flowering genetics make it easy to grow. The seeds being feminised means only female plants flourish resulting in no wasted space. This simply translates to the fact that since all plants are female you get more yields. Attaining a height of anywhere between 60-80cm, they are small and bushy. They have an open structure, which lets light to penetrate freely throughout the plant helping in getting better and bigger harvests. The buds are dense with an aroma of sweet skunk. A single plant yields nearly 165gm. 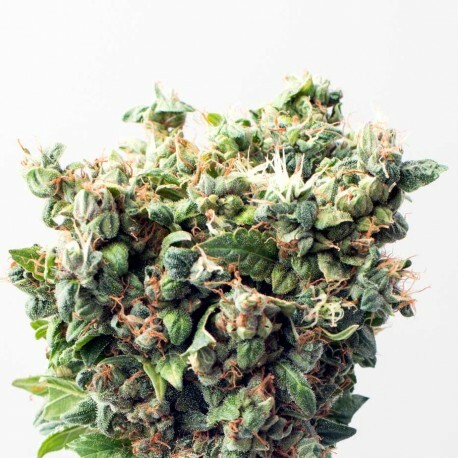 It is obtained from a complex cross of Ruderalis, Indica, and Sativa strains. The mix of these strains produces a strong variety that is easy-to-grow, auto flowering, and having big dense buds with the Indica effect of Critical being quite dominant. The plant is easily manageable and highly stealthy and is breeders’ delight. It can be planted both indoors and outdoors. They are ready for harvesting in a short period of 9 weeks after planting. The final stage of maturation is evident with the production of many orange pistils and a peculiar smell that is a characteristic inherited from Critical+. The flowers on the plant are more in proportion to the leaves. Crossing the best plants has resulted in the creation of an excellent strain that has awesome aroma and taste. The maintenance of high genetic diversity ensures that the plant has optimum resistance to pests and diseases making it easy to grow and maintain. velvet on the troth,sweet tasty. and mayby the best auto up there whith the amnesian haze this was alsow werry werry good smoke. I bought and sowed these Cridical seeds 12 weeks ago .. 10 seeds where 6 have become plants .. 2 seeds did not come and 2 never came out of the first stage ... 2 of the plants are 130-140 cm tall with a lot of branches ... They are in a greenhouse with daylight as the sun gives ... When can I expect them to blossom ?? should I do something to make them flourish ?? Recebi um e-mail dia 05/01/18 dizendo que minhas sementes foram enviadas. Teria como ver pelo pedido, de quanto tempo ainda falta para chegar ? What size tent would be ideal for one Critical auto plant ? Hello. I tokd to a friend to buy me those seeds but not as autoflower. My question is. If I have critical autoflower I can use again to cut for clones or it will make seeds on my buds and I can use them? If yes are all seeds female or? Qual o m~es correto de plantar essa , e desde a parte vegetativa ate a colheita, quantos mêses ? how do i know when its finished budding??? It says around 165 grams per plant. Is that 165 grams total or 165 gram/m2 which making it less?